The Absolutely Fantastic boxed set of super-silly stories filled with Tom's jokes, scribbles and doodles. One brilliant collection of the funniest books in the world - he first eleven best-selling Tom Gates books! This box contains the first eleven books from Tom's life story: Th... read full description below. The Absolutely Fantastic boxed set of super-silly stories filled with Tom's jokes, scribbles and doodles. 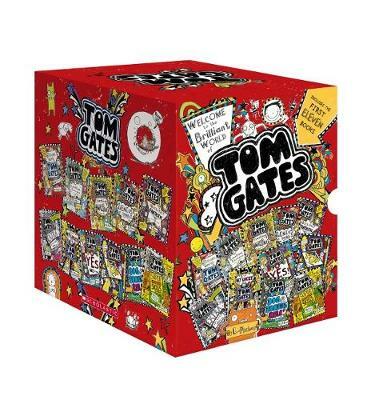 One brilliant collection of the funniest books in the world - he first eleven best-selling Tom Gates books! This box contains the first eleven books from Tom's life story: The Brilliant World of Tom Gates, Excellent Excuses (and other Good Stuff), Everything's Amazing (Sort Of), Genius Ideas (Mostly), Absolutely Fantastic (At Some Things), Extra Special Treats, A Tiny Bit Lucky, Yes! No. (Maybe...), Top of the Class (Nearly), Super Good Skills (Almost...) and Dog Zombies Rule (for now).